You and your bestie will enjoy Biolight BIOLIGHT™ Miracle Facials w/ Glyco-Sea Glycolic Peel that will brighten your complexions (face, neck and throat) with the power of rejuvenating seaweed. Our amazing Eye Collagen Mask Treament refreshes tired under eyes and smoothes wrinkles Arms and hands will be lavished with a luxurious Spa Arm & Hand Moisturizing Massage Treatment. 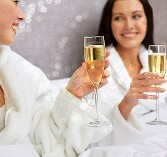 You will complete your spa day with side by side Mimi's Mimosa Pedicures with your choice of lacquer. Libations and spa edibles are served during your spa visit. Get ready for a fabulous season with a rejuvenated and youthful looking complexion accompanied by beautiful eyes. A relaxing Repechage Hydra 4® Facial rehydrates dull skin and while leaving your sensitive skin calm with a refreshed glow. Brows are sculpted with our expert Trio Brow Arch. Your new look is complete with Luxe Mink Eyelash Extensions. You are going to look amazing!